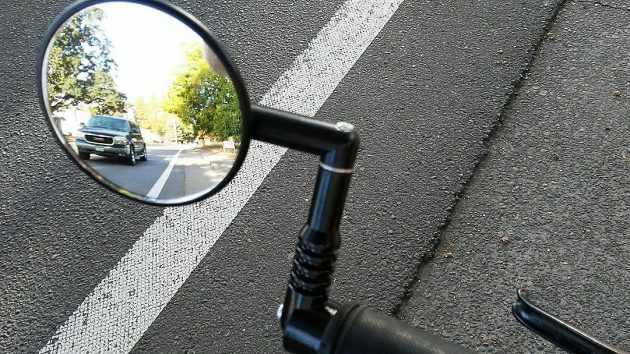 A mirror on your bike can keep you from turning in front of a vehicle coming up from behind. On the bike the other day, I stuck out my left arm after not seeing anyone behind me and turned left. This earned me an angry honk from the driver whose vehicle I had not seen and who, I’m glad to say, missed me by a few yards. The experience caused me to buy a mirror and install it on the bike I ride around town. It also reminded me of a brief exchange at a recent meeting of the Albany City Council. Councilman Mike Sykes complained about reckless and dangerous behavior by people on bikes and wondered if anything could be done. He had a point. It’s not unusual to see riders, usually male, more or less on the young side, wheeling their way through traffic without regard for life and limb, their own or anybody else’s. They run red lights. They ride on the wrong side of the street, against traffic. You wonder how they have survived as long as they have. Can anything be done? If so, I don’t know what. The law is never around when you see one of these guys. Even if a cop managed to catch up with and stop him, what good would a ticket do for someone who lives with no concern for rules? As for my situation on Salem Avenue the other day, I didn’t intend to cause the driver to have to hit the brake. (If he did; he may have been too busy hitting the horn instead.) I had not seen him coming up behind me, even though I looked. Too bad a great deal of bike riders aren’t as careful and aware as yourself. I don’t think I’m alone in saying the reckless and dangerous behavior mentioned in you article is more common than you think. Law enforcement absolutely should begin issuing tickets to bike riders who violate the law. It’s called lights, siren and PA. Instruct them to pull over and the process begins. If there are no consequences why change bad behavior? As for honking a horn, how else would one get the attention of another vehicle (including bikes) in an effort to avoid an accident? You are spot on about the (mostly) young, (mostly) male bike riders who ride as if the world is their banana to peel, so too speak. Just in case you’re wondering, I am an old f**t who also rides a bicycle (with a mirror), rides a motorcycle, and drives a car. I suggest it would be good for all motorists to read the section in the 2018-19 Oregon Driver Manual, pg 38 to 40, on Bicycles (What is a Bike Box? A sharrow? etc.) and bicyclists should also read the Oregon Bicyclist Manual. Bicyclist/motorist courtesy is not only just courtesy, it is also common sense and it is the Law! Your blog betrays your headline. The honk caused you to install a mirror. I have certainly had drivers come up behind me and honk for no reason at all (other than, perhaps, pure malice). All that does is startle the begeezus out of me, making me more unsafe. Some drivers just can’t stand the idea that bikes have any right to be on the road. Mirrors help keep us safe. Why would any cyclist not use them? I need a mirror for my bike too. Maybe the driver of the truck was just being nasty. I don’t know of any other way to get the attention of a bicyclist. The car-driver isn’t sure if the peddler is aware of the car or in an endorphin ecstasy. The peddler isn’t sure if the car-driver is patient or a nut looking for a brushoff. It seems patently obvious from the comments made this far; bicycles have no business on public roadways. By Hering’s own admission, many bicyclists flout the canons of traffic safety. Perhaps the City Council, in it’s wisdom, could pass new legislation banning bikes before the problem grows more problematic. While the rest of the country sinks into ever greater polarizaion along the predictable red/blue divide, the (at least) 3 personas/aliases of Jacobin show us an interesting alternative, if only one knew how far tongue-in-cheek to take each comment. Speaking of polarization, NPR had an excellent show last night, “How The 1990s Paved The Way For Today’s Political Divide.” (spoiler alert: the brilliant Gingrich played a major part).